Introducing the GO! Qube 12” Companion Set – Angles that is designed to work with the existing GO! Qube 12” Mix & Match Block (55778) to create an array of blocks and patterns. Just add an AccuQuilt GO! Fabric Cutter and fabric! The GO! 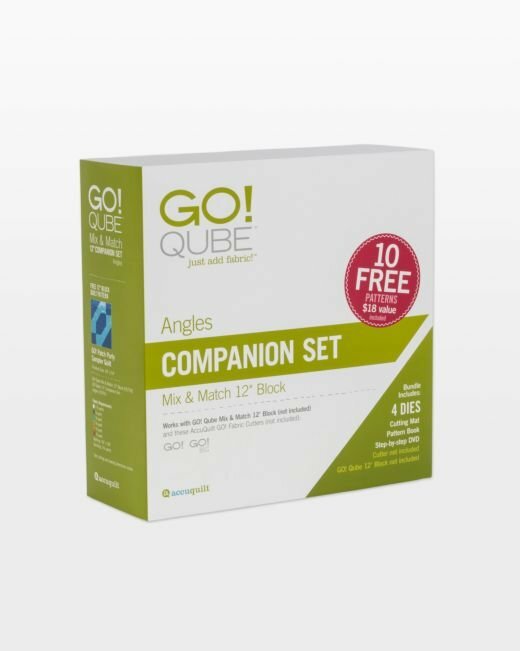 Qube 12" Companion Set - Angles includes four GO! shapes, a cutting mat, an instructional DVD, PLUS a FREE 24-page pattern booklet and an innovative storage system. The GO! Qube 12” Companion Set - Angles includes four dies, each labeled with a number 13 to 16 which extends the 1 to 8 die numbering system of the GO! Qube 12” Mix & Match Block. There are 9 patterns PLUS 1 quilt pattern included with numbered shapes to tell you which die to use so it makes it easy to know which shapes you need for each block.